James and Olivia from Samford Valley came to Easy Living Kitchens after recently purchasing their approx. 15 year old property. They had already commenced major cosmetic renovations throughout and removed the existing kitchen, leaving us a blank slate to work with. They both had a strong idea of what they wanted by way of layout and finish colours. During our initial consultation we discussed the pros and cons of various surface finishes and the clients chose to go with Polytec Thermolaminate in Alabaster for the kitchen doors and drawers, and matte Black for the island bench. Door profile chosen was Manchester with Barchie handles on all lower doors and drawers, whilst overhead doors are Manchester with finger pull. Drawer hardware chosen was Blum Antaro TANDEMBOX Soft Close, whilst hinges are Blum BLUMOTION Soft Close. The choice of drawer and door hardware is a major factor to increasing the longevity of any new kitchen. At Easy Living Kitchens we’ve tried and tested many of the leading brands as well as cheaper imports, and we can confidently back the claims of Blum being the superior solution with a good range of choice, backed by a lifetime warranty. 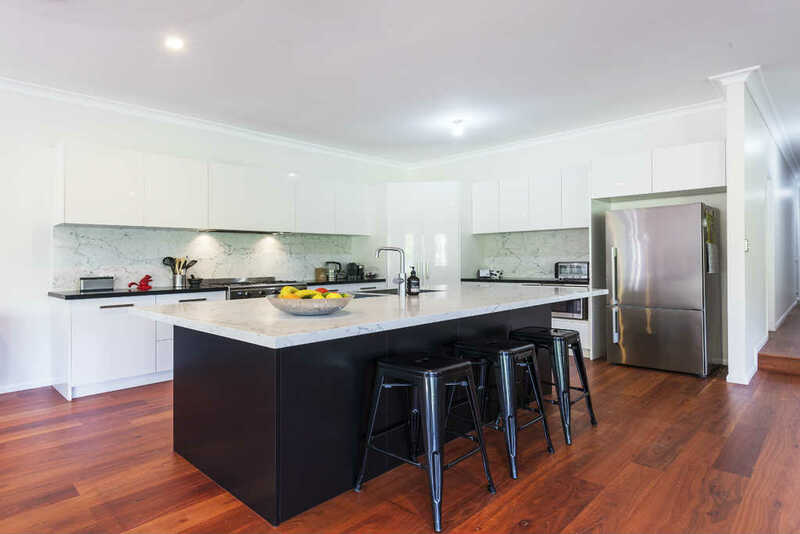 Caesarstone White Attica was chosen for the island benchtop as well as the wall splashbacks, whilst Jet Black was chosen for the remainder benchtops. In this case our clients chose to source independently stainless steel appliances, and Oliveri sinks and tap mixer. Now that their new kitchen is complete and a big part of their day to day life, both James and Olivia are thoroughly rapt and looking forward to entertaining and sharing many times with friends and family around the focal point in their newly renovated home.